About 7:00 pm, Jun. 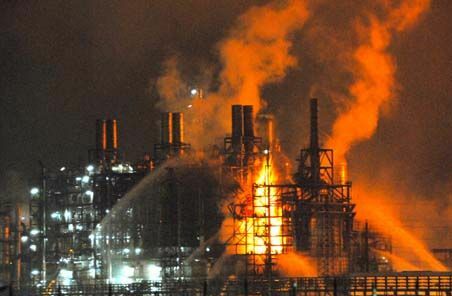 3, 2008, Maoming Petrochemical, a subsidiary of Sinopec in Maoming, Guangdong Province, caught fire and ceased production due to a lightning strike. Meanwhile, the lightning stroke the No.2 cracker and fire caused the company has to shut down two crackers, and all derivatives units. Fortunately, there were no deaths or injuries. Maoming Petrochem has two crackers with combined capacity of 1.02 Mt/a. The large one (No.2 cracker) is 640 kt/a and the small one (No.1 cracker) is 380 kt/a. Up to now, Maoming Petrochem has just restarted its small 380 kt/a (No.1 cracker) ethylene unit, which is undamaged after a nearby fire. But the large one (No.2 cracker) is still shut down and the company source declined to say when it might restart production, or how badly damaged happened. Maoming Petrochem accounts for around 1/6 ethylene capacity of Sinopec and around 1/10 ethylene capacity of China. The company produced ethylene 963 kt in 2007 and 522 kt in 2006. China Petroleum & Chemical Corp (Sinopec) said its Maoming ethylene plant has returned to full production after being shut for half a month following a fire. The Maoming plant caught fire on June 3 due to a lightning strike. One 360,000-ton-capacity ethylene facility resumed production on June 6 after safety checks and the other 640,000-ton-capacity line restarted production on June 18, it said. On May 25th, 2008 Henan Zhongyuan Dahua Group Co., Ltd. (Zhongyuan Dahua) conducted successful wet commissioning on the 500 000 t/a methanol project. With an investment of RMB2.59 billion, construction on the project was started in February 2005. After completion of the project, the annual output value will be added by RMB1.6 billion for the company. The enterprise has the annual production capacity of 300,000 tons of ammonia, 520,000 tons of urea, 600,000 tons of urea-based compound fertilizer, 30,000 tons of hydrogen peroxide, 30,000 tons of melamine, 6,000 tons of industrial cooling water treating agent,10,000 tons of textile agent, 20 million sets of woven bags and the facilities for producing plastic products and oxygen and etc. On May 11th, 2008 Zhejiang Transit Fluorine Silicon Material Co., Ltd.(Zhejiang Transit) held a ceremony for the startup of the first phase 60 000 t/a organosilicon monomer project in Quzhou, Zhejiang province. With an investment of around RMB600 million, construction on the project was started in June 2006. Zhejiang Transit, jointly funded by Zhongtian 中天 Group and Zhejiang Juhua Group浙江巨化集団, is engaged in R & D, production and sales of organosilicon monomer and related products. An ABS plant to be built in China will use Dow's MABS (mass ABS) technology. The 140,000 tonnes plant will be built in LiaoNing Province by LiaoNing HuaJin Chemical （盤錦エチレン） and will come on stream in 2011. Dow has used MABS Technology in its own plants for more than 40 years, but it has only recently become available for licensing. In contrast to traditional batch-to-batch emulsion ABS processes, the continuous mass solution process is said to produce a high purity polymer and enables greater lot-to-lot consistency. By minimizing impurities, the resulting product has a "whiter" base, which is easier to colour. China consumes five times more ABS than the USA and by 2012, says Dow, ABS demand in China is projected to grow to 4·3 million tonnes, the equivalent of more than half of current global ABS production capacity. Zhejiang Zhongning Silicon Co., Ltd. (Zhejiang Zhongning) has recently commenced the construction of a 4 500 t/a polycrystalline silicon project in Quzhou Hi-tech Industrial Park, Zhejiang province. With a total investment of around RMB4.0 billon, the project will be executed into three phases. With an investment of RMB1.2 billion, the first phase has a capacity of 1 500 t/a polycrystalline and will be completed in two years. In early Jun. 2008, Lanzhou Petrochemical, a subsidiary of PetroChina, has started up and commercial run its acrylic acid and acrylates project in Lanzhou, Gansu Province. With total investment of USD 165.7 million (RMB 1.16 billion), the project include 80,000 ton/year acrylic acid and a 115,000 ton/year acrylates (methyl acrylate, ethyl acrylate and butyl acrylate). This is the first acrylics project in northwest China, according to industrial source, the project uses the technologies of two-step propylene oxidation producing acrylic acid and continuous esterification producing acrylates, which is self-developed by PetroChina and has self-owned intellectual property. The acrylics project was started construction in H1 2006, and mechanical completed in Oct. 2007. It is started trial run in Apr. 18, 2008. In 2007, China imported acrylic acid 45.3 kt and exported 23 kt acrylic acid; in the same period, China imported acrylates 88.7 kt and exported 50.5 kt acrylates. PetroChina Lanzhou operates a refinery with 10.5 million ton/year processing capacity, and 700,000 ton/year ethylene cracker. On Jun.18, 2008, Momentive Performance Materials Inc. (MPM) started up a silicones project in Nantong Economic Developent Zone, Nantong, Jiangsu Province. The plant is operated by Momentive Performance Materials (Nantong) Co, Ltd, a whole subsidiary of MPM. With the total investment of USD 78 million, the plant has capacity of 20,000 t/a specialty silicone products, including specialty silicone emulsion, resins, coatings and sealant etc., serving industries ranging from agriculture, construction to medicals and electronics. It is the 4th silicones plant of MPM in China, the company has set up two plants in Shanghai and one plant in Shenzhen, Guangdong Province. The 5th silicones plant is under construction and expected to start up in 2009. It is the 51:49 jv between Zhejiang Xin’an and Momentive (Singapore), a subsidiary of MPM. Located in Jiande, Zhejiang Province, it is named as Zhejiang Xin’an Momentive Silicone Company, and has approximately 100,000 ton/year methylchlorosilanes (MCS) products facility. The 5th plant will supply feedstock to the 4 others once it start up. As the world's second-largest silicones producer, MPM aims to make revenue of USD 400 million this year in China, which now accounts for about 15 percent of its global revenue. In 2007, the company got revenue of USD 2.5 billion.. In China, the demant for silicone products has more than 25% growth rate and indicating a short supply, according to MPM, the Nantong plant will further improve the integrated capabilities of Momentive for research and development, production and sales in China, and improve the product supply chain and service efficiency. MPM is the former GE Silicone, now it is owned by a capitals management company - Apollo. China's SunVic Chemical Holdings has started construction of a 230,000 mt/year propylene plant at Xiangshui, Jiangsu province, which is expected to be completed by December 2009, a source close to the company said Tuesday. The plant will be linked to a fluid catalytic cracker that will use fuel oil as feed. Apart from propylene, the FCC will also produce gasoil, gasoline and LPG. The company will consume the propylene, while the gasoil, gasoline and LPG output will be sold. SunVic currently buys up to 143,500 mt/year of propylene, sourced locally and through imports, for use in its 205,000 mt/year acrylic acid plant. The plant supports a 250,000 mt/year acrylate ester facility. Last year, the company's main propylene suppliers were Samsung Corp., Shougang Shanshou Chemical Co., Wuxi Petroleum Chemical Engineering Factory and the China Petroleum and Chemical Corporative Shengli Oilfield Company. SunVic listed on the Singapore Exchange in February 2007. The National Development and Reform Commission (NDRC) said it has approved Sinopec Shanghai PetroChemical's plan to expand its ethylene plant. Shanghai PetroChemical will expand the annual capacity of the ethylene facility to 600,000 tons from 150,000 tons, NDRC said. Sinopec Shanghai will also build a 300,000-ton-capacity polypropylene and a 380,000-ton-capacity glycol facility near the ethylene plant, it said. The NDRC did not disclose the investment amount or the timetable for operations. Shanghai Petrochemical Co. (SPC), a subsidiary of Sinopec, has got the final approval from NDRC for its ethylene project. SPC has two crackers, the #1 cracker has capacity of 700,000 t/a, the #2 cracker has capacity of 150 t/a. SPC will build a new ethylene project with capacity of 600,000 t/a and shut down its #2 unit. That means SPC's total capacity will reach 1.3 Mt/a in the future. SPC will also build a 300,000 t/a PP and a 380,000 t/a MEG and utilities projects near the new ethylene cracker. As of end 2007, SPC has total ethylene capacity 850 kt/a, and MEG capacity 610 kt/a. In 2007, SPC processed crude oil 8.94 Mt, produced ethylene 869 kt, propylene 456 kt. Now, the company is building a 600kt/a PX project which is expected to start up in 2009. （隣接して、BASF、上海華誼公司、SINOPEC上海高橋石化のJV Shanghai BASF Polyurethane が16万トンのTDI）. Albemarle Corporation has completed its acquisition of the 100% stake of two polymer additive joint ventures in China: Ningbo Jinhai Albemarle Chemical & Industry Co., Ltd. and Shanghai Jinhai Albemarle Fine Chemicals Co., Ltd. The agreement was completed on June 30th, near the one-year anniversary of Albemarle's acquisition of a majority ownership stake in the 'Jinhai Albemarle' JVs in July 2007. With the new, 100-percent ownership agreement, both facilities are now wholly owned subsidiaries of Albemarle Corporation. Albemarle announced earlier this year to double antioxidant production capacity at the Shanghai facility. On July 10th, Reichhold signed a letter of intend with Tianjin Economic Technology Development Zone (TETDZ) on production of unsaturated polyester resins. Reichhold intends to spend US$40 million to build an unsaturated polyester resins plant at Tanggu, TETDZ. The proposed plant is expected to produce 50 thousand tons of unsaturated polyester resins per year to meet the customers' needs in wind energy sector in Chinese market. Recently, Beijing Organic Chemical Plant has started construction for move and expansion project of vinyl acetate (VA) and vinyl acetate-ethylene (VAE). Move is for the environmental reason. With total investment of USD 223 million (RMB 1.54 billion), the project includes move and expansion from 90,000 t/a VA to 180,000 t/a; move and expansion from 50,000 t/a VAE emulsion to 100,000 t/a; move of 27,000 polyvinyl alcohol and 40,000 t/a VAE copolymer. All the move and expansion project will be completed in 2010. The target site for the project is Yanshan petrochemical. Beijing Organic Chemical Plant is a subunit of Beijing Eastern Petrochemical, the latter is a subsidiary of Sinopec Yanshan. Beijing Eastern also has 80,000 t/a Acrylic Acid and Acrylic Ester in another site in Beijing. Beijing Organic Chemical Plant located at Dajiaoting, Chaoyang District, Beijing city. Beijing Eastern Chemical Plant located at Tongzhou District, Beijing city. In 2007, China produced 1 million ton and consumed 1.25 million ton VAM. PetroChina Sichuan Petrochemical Co., Ltd. has selected UNIPOL™ Polypropylene Process Technology from Dow Technology Licensing for its new 450 KTA polypropylene facility in Chengdu, Sichuan Province, and Aker Solutions will provide the process design and technical advisory services. The PetroChina Sichuan facility will be one of the largest single-train polypropylene facilities in The People’s Republic of China. The plant will be part of PetroChina Sichuan’s 800 KTA ethylene complex in Chengdu, and is due on-stream in 2010.